Entirely USA made of fiber from my Angora goats and sheep, supplemented with fibers from other small USA farmers. Dancing Waters Farm is a smokefree, animal friendly farm, (no animals are taken to slaughter) which is why the majority of my fibers are from goats or sheep more than three years old. 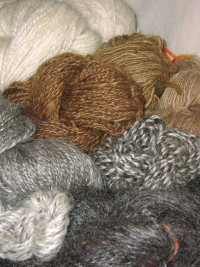 Hand dyed or naturally colored yarns are available, and custom colors can be provided on request. Fiber is hand washed, and carded into roving. You may notice a small amount of vegetable matter (VM) as my fibers are gently processed – no harsh chemical treatments to dissolve vegetation or clean the fibers. It is also your assurance of the highest quality fiber, as it has not been weakened or damaged by processing. The high mohair content ensures that products made from the roving, tops or batts are longer lasting and more lustrous than pure wool. Fiber care: Hand wash, air dry. Recommended Uses: sweaters, mittens, rugs, felting. Weavers please look under millspun yarns. NOTE: Shipping included. Please contact me for other quantities and at the farm pricing if you would like to pickup products. All products ship USPS Priority Mail 2-3 Day, unless otherwise requested. None available at this time. Pictures below show some of my dyed and natural colored handspun skeins. Skein Prices: $19/4 oz skeins, $15/3.5 oz. skeins, $14/3 oz. skeins, $12/2.5 oz. skeins plus shipping. 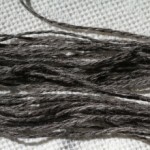 Flat rate shipping provides a discount on purchases of more than 4 skeins. Skein weights are rounded to the nearest half ounce for pricing but actual approximate weight is listed in the description. 50% Mohair 50% Wool. ~250 yards, Sport weight, 2ply, 4 ounce skeins. Click on Photo for details. Hand Kettle Dyed Before Carding. 50% Mohair 50% Wool, ~200 yards, Sport weight, 2ply, 3.2 ounce skeins. Click on photo for details. Skeins. 50% Mohair 50% Wool unless otherwise specified. Click on photo for details. Millspun – Sold by Weight You Specify: $5/ounce, $19/ 4 oz, $28/ 8 oz (48 % savings), $49/pound (54% savings) + shipping. Savings is total of fiber + shipping vs 1 oz fiber purchase. Weaving yarn. Each bump makes ~12 square feet of rug (2’x6′ or 3’x4′) and are ~2 pounds, 100 yards. Price: $45/ bump plus shipping. Click on photo for details.